of American-influenced “Ivy Style” fashion among students in the trendy Ginza shopping district of Tokyo. The product of four sartorial style enthusiasts, Take Ivy is a collection of candid photographs shot on the campuses of America’s elite, Ivy League universities. The series focuses on men and their clothes, perfectly encapsulating the unique academic fashion of the era. Whether lounging in the quad, studying in the library, riding bikes, in class, or at the boathouse, the subjects of Take Ivy are impeccably and distinctively dressed in the finest American-made garments of the time. 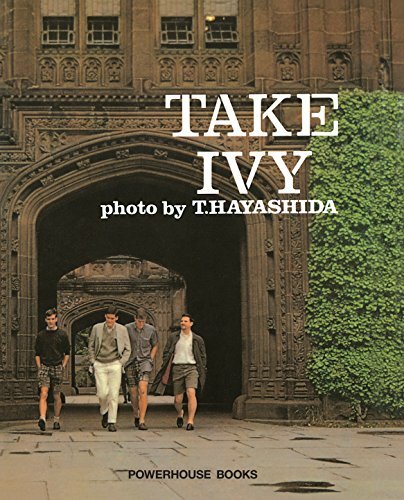 Take Ivy is now considered a definitive document of this particular style, and rare original copies are highly sought after by “trad” devotees worldwide. A small-run reprint came out in Japan in 2006 and sold out almost immediately. Now, for the first time ever, powerHouse is reviving this classic tome with an all-new English translation. Ivy style has never been more popular, in Japan or stateside, proving its timeless and transcendent appeal. Take Ivy has survived the decades and is an essential object for anyone interested in the history or future of fashion.